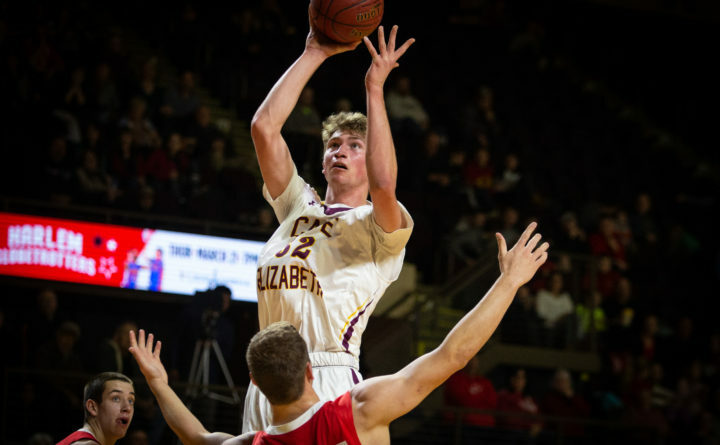 Cape Elizabeth High School's Andrew Hartel takes a shot in the boys' Class B South regional championship basketball game at the Cross Insurance Arena in Portland on Saturday. No. 3 Cape Elizabeth went into the second half of their Class B South championship game against No. 8 Wells down 3 points, but held off the two-time defending champions for a 39-38 win at the Cross Insurance Arena in Portland on Saturday. Cape Elizabeth will face the winner of Saturday’s Class B North game between No. 2 Caribou (17-3) and No. 1 Hermon (20-0) next Saturday at 2:45 p.m. at the Cross Insurance Arena in Portland for the state title. Wells High School's Matt Sherburne pass the ball between Cape Elizabeth High School's Nathan Mullen (left) and Tanner Carpenter in the boys' Class B South regional championship basketball game at the Cross Insurance Arena in Portland on Saturday. Saturday’s B South title game was a repeat of 2018, in which No. 1 Wells and No. 2 Cape Elizabeth faced off for the regional crown. Wells emerged victorious in that contest, winning 40-35. Cape Elizabeth’s season record improves to 14-7. 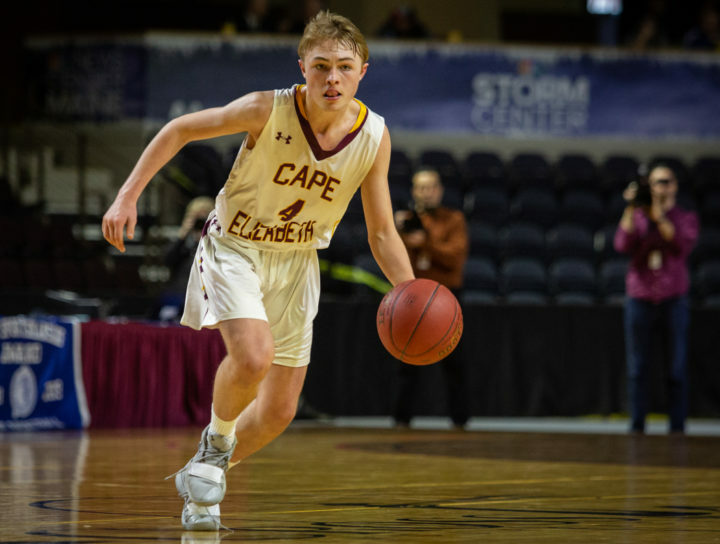 Cape moved down to Class B in 2018 after competing in Class A the two prior years. They last won a state championship in 2015 as a member of Class B.
Cape knocked off No. 6 Freeport in the quarterfinals 56-49, and bested second-seed Maranacook 64-61 in the semifinals. Wells (11-11) had to knock off multiple higher-seeded teams to earn their place in the regional championship game. The Warriors bested No. 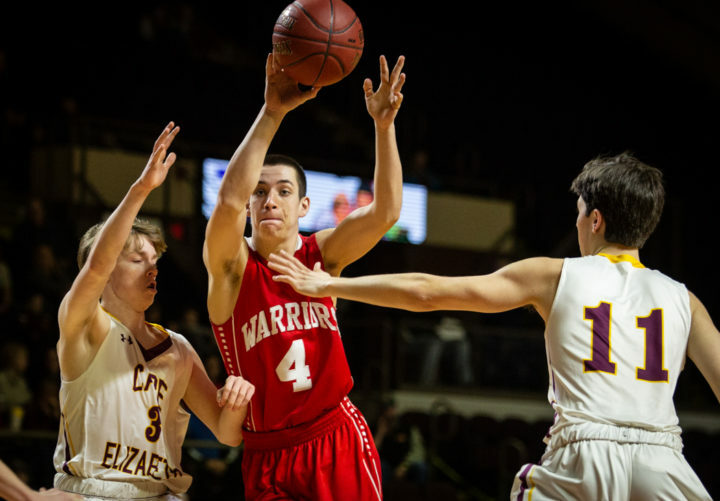 4 Gray-New Gloucester in the semifinals 49-37, and toppled the top-seeded Mountain Valley boys 64-61 in the quarterfinals. 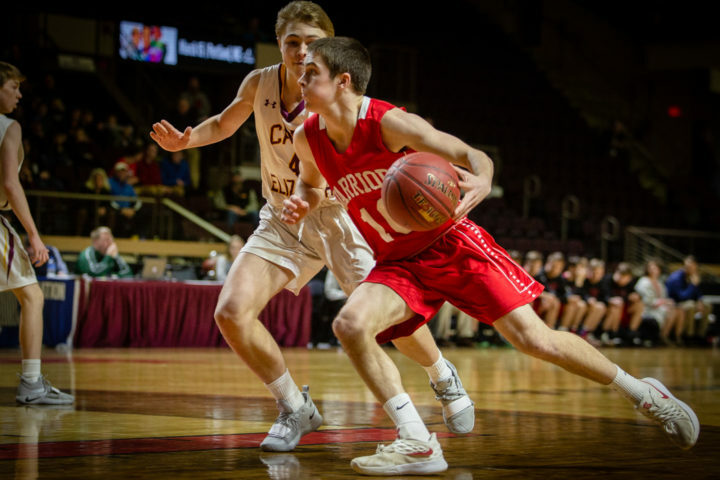 Cape Elizabeth High School's Quinton Morse brings the ball up the court in the boys' Class B South regional championship basketball game at the Cross Insurance Arena in Portland on Saturday.